I’ve just visited the so-called ‘Dali Triangle’, including his wife’s castle-home in Pubol and his monument to surrealism in Figueres, and it has changed my opinion of the artist. 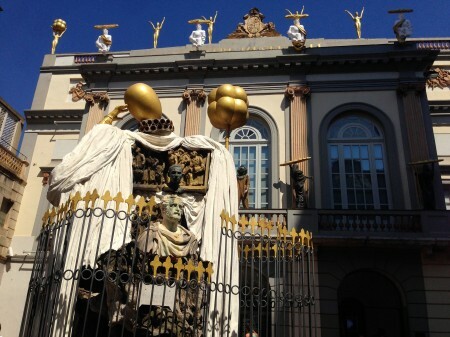 Many wrote off Salvador Dali because of his unabashed commercialism, his bad-boy antics and his clown-prince behaviour. It’s an easy mistake to make, but a mistake nonetheless. Beneath the tomfoolery there’s a bedrock of original thinking and peerless technique that few modern artists can hope to match. There’s a book about Dali that explains his connection to the landscape, and once you have seen photographic comparisons they’ll stay in your head forever. It’s why Salvador Domingo Felipe Jacinto Dalí i Domènech is the key surrealist artist by whom all others must still be measured. An astonishing draughtsman who could paint in virtually any style and was strongly influenced by Renaissance masters, he angered critics who tried to take him seriously. Oh, and I met him. But you know that already if you read the paperback edition of ‘Film Freak’. There’s a terrifically funny book by Luis Bunuel called ‘My Last Breath’, about Bunuel, Federico Garcia Lorca and Dali on the rampage together – forget boring Hemingway and pompous Gertrude Stein in Paris, how thrilling it must to have been to hang out with these three! Dali’s influences include Miro, Picasso, Vermeer and Valazquez (why he grew his moustache), but he developed a curious style that seems entirely his own. It seems inevitable that a man so affected by the subconscious should meet Sigmund Freud, who called him a fanatic. Dali refused to commit to Leftist – or any – politics – feeling that an artist should be apolitical, and was further distanced from other surrealists by his open embrace of the commercial. Yet much of his work remains profoundly disturbing. Accompanied by his lifelong muse Gala he turned his hand to virtually every imaginable art form, from shop window displays to theatre designs, sculpture, fashion, jewellery, furniture, film and literature. He created ‘Destino’ for Walt Disney’s ‘Fantasia’ (completed a few years ago by Roy Disney) and the dream sequence for Hitchcock’s ‘Spellbound’, but his grand-scale trompe l’oeil scenes are housed in the extraordinary Teatro-Museo. 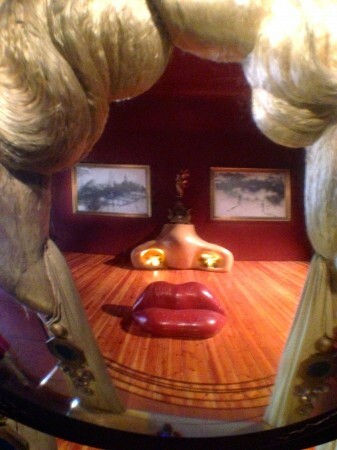 To view Mae West you climb a steep staircase and peer through a lens to align the sofa in the room ahead of you with the paintings (I took this on my phone). This is Dali as showman, foolish and funny. 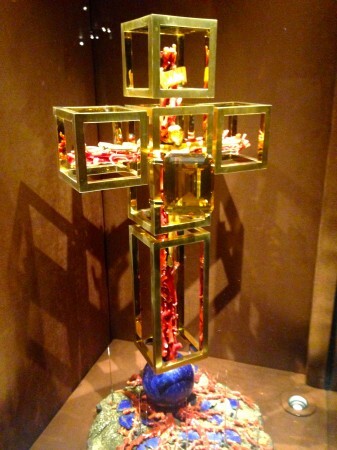 But his etchings and sketches are delicate and thoughtful, and his jewellery work combines a love of mathematics, religious iconography and DNA spirals. A pair of lobster-telephone earrings are surprisingly delicate and elegant. 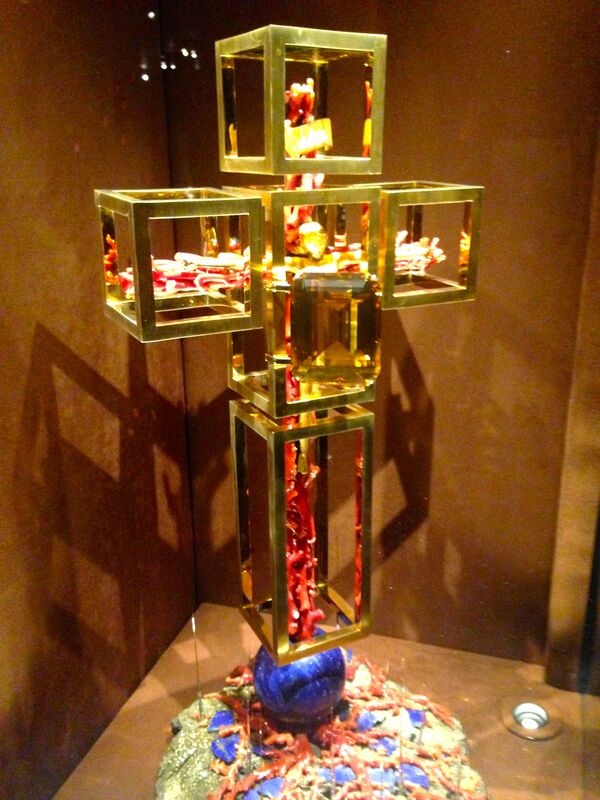 There’s a beating ruby heart brooch on display, and this twisted Christ figure, imprisoned in a golden tesseract, is moving, raining a crystalline downpour on rocks below. You come away from viewing his strikingly fresh-looking modernist homes, his raining cars, crucifixions, unfolding paintings, 3D trickery and immense, freakish sculptures of octopi, rhinos and enthroned figures balanced on truck tyres wondering ‘How could one man have created all of this?’ But bearing it mind that Dali’s catchphrase was ‘Surrealism, c’est moi’ it all seems possible. I have always liked Dali’s work,Admin. It seems to encapsulate all of the best and worst dreams I’ve ever had. Happy Holiday,btw! Aren’t the Spaniards great! They were so ahead of us in understanding how the combination of materialism and anxiety would affect us all. Andrea Camilleri or rather Inspector Mantalbano quote Dali often…right on point.